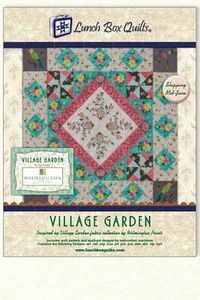 Embroidery designs inspired by the Village Garden fabric collection by Kaye England from Wilmington Prints. Quilt pattern is included to make 49" x 65" quilt. Package comes with embroidery designs on CD and a redemption code for downloading. Embroidery designs in the following formats: ART, DST, EXP, HUS, JEF, PCS, PES, SEW, SHV, VIP, VP3.